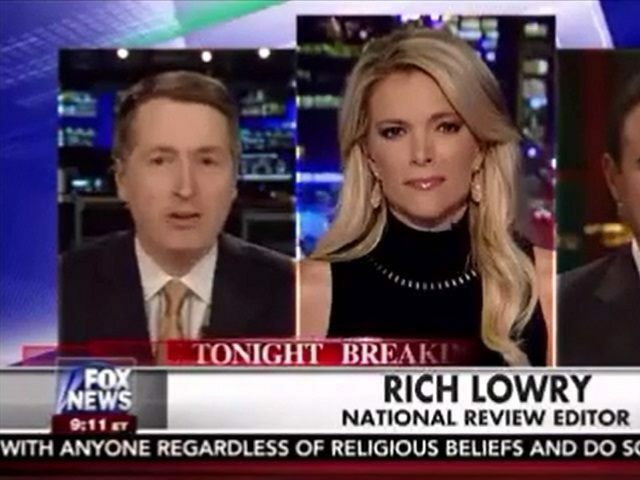 National Review Editor and Fox News Contributor Rich Lowry said GOP presidential candidate Carly Fiorina cut GOP frontrunner Donald Trump’s “balls off with the precision of a surgeon” on a primetime national television broadcast, referencing Fiorina’s performance in the second GOP primary debate. “What did you just say?” host Megyn Kelly responded. “You can’t say that,” as she laughed at Lowry’s statement. Lowry’s attack against Trump took place during Fox News’ The Kelly File on the same day Trump announced he wouldn’t be appearing on Fox News anymore since the “Fair and Balanced” cable network has been reporting unfairly about him.
.@realDonaldTrump so it’s OK for you to insult Carly’s looks, but you can’t handle me describing what happened to you in the debate? He has previously appeared on The Kelly File and said Trump spoke like an eighth grader. In Fox News’ post debate poll released Wednesday, Trump was the clear frontrunner with 26 percent and Dr. Ben Carson came in second with 18 percent.